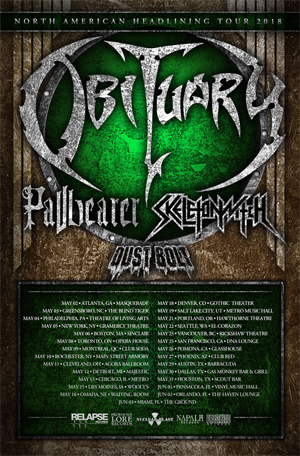 Death metal legends OBITUARY have announced an early Summer North American headline tour with support from PALLBEARER, SKELETONWITCH and DUST BOLT. The tour begins May 2nd in Atlanta, GA and ends June 3rd in Miami, FL. A full list of confirmed tour dates is available below. “We are stoked about our North American tour and super excited to be back at the headlining spot. We have been very fortunate to be a part of some killer tours for our last few US/Canada runs as support to CARCASS, CANNIBAL CORPSE and KREATOR but that came with limits on time and production value. Now it’s time to bust out the Big Guns, dig deep into our musical pockets and pull out some oldies but goodies!! Additionally, OBITUARY will embark on a month-long Spring 2018 European headlining tour in March. The tour begins March 3 in Cologne, DE and ends April 1 in Schijndel, NL at Paaspop Festival. OBITUARY’s self-titled new album is out now worldwide on CD/LP/Digital via Relapse Records. Physical and digital orders plus streams are available now at bit.ly/ObituaryST. OBITUARY’s self-titled album is receiving high end of the year praise charting on notable album of the year lists such as Rolling Stone (#14 - Best Metal) Revolver (#11), Decibel (#14) and Loudwire (#21) among numerous others.